So very boho and so very romantic, this sweet wedding dress by designer Stella York is sure to become an instant classic. Lace and French tulle over matte-side lavish satin create a relaxed A-line silhouette with illusion lace off-the-shoulder long sleeves. The bold and unique lace is what makes this dress perfectly boho. The long sleeves feature just a hint of twinkle on the lace as it finishes around the neckline, back and wrists in an organic style. The flower lace motifs “grow” over the natural waistline and onto the tulle skirt. This vine-inspired lace twists around to the sheer, open back that is finished with floating fabric-covered buttons. To try this gorgeous bridal gown on at our bridal boutique in Hinckley please contact us. 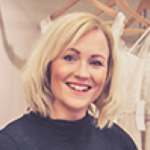 Whilst visiting our bridal shop you will also have the chance to try on many more wedding dresses from our bridal designers WToo by Watters, Essence of Australia, Enzoani and Eliza Jane Howell. We also have a great choice of bridesmaids dresses and bridal accessories.